The acronym HTML stands for Hypertext Markup Language. It's the primary markup language used to write content on the web. Every single web page on the internet has at least some HTML markup included in its source code, and most websites are comprised of many HTML or .HTM files. Whether or not you intend to build a website is irrelevant. Knowing what HTML is, how it came to exist and the basics of how the markup language is constructed really show the amazing versatility of this basic website architecture and how it continues to be a major part of how we view the web. If you're online, then you've come across at least a few instances of HTML, probably without even realizing it. HTML was created in 1991 by Tim Berners-Lee, the official creator, and founder of what we now know as the World Wide Web. He came up with the idea of sharing information no matter where a computer was located, through the use of hyperlinks (HTML-coded links that connect one resource to another), HTTP (a communication protocol for web servers and web users) and the URL (a streamlined address system for every web page on the internet). HTML v2.0 was released in November of 1995, after which were seven others to form HTML 5.1 in November of 2016. It's published as a W3C Recommendation. The HTML language uses what are called tags, which are words or acronyms surrounded by brackets. 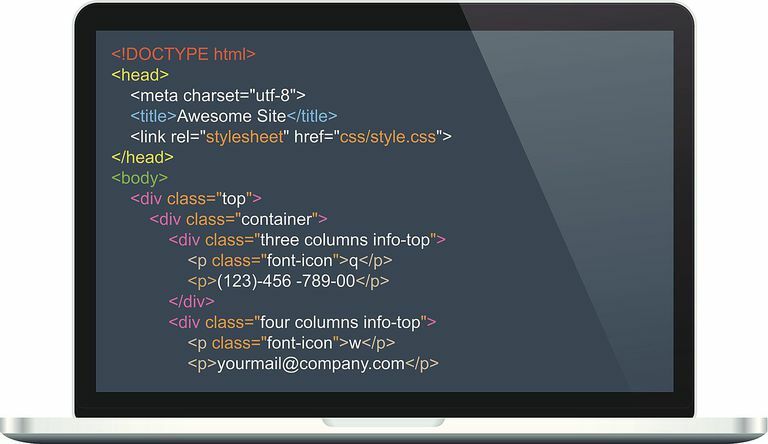 A typical HTML tag looks like what you see in the image above. HTML tags are written as pairs; there must be a beginning tag and an ending tag in order to make the code display correctly. You can think of it like an opening and closing statement, or like an uppercase letter to start a sentence and a period to end it. The first tag designates how the following text will be grouped or displayed, and the closing tag (signaled with a backslash) designates the end of this group or display. How Do Web Pages Use HTML? Web browsers read the HTML code contained in web pages but they do not display the HTML markup for the user. Instead, the browser software translates the HTML coding into readable content. This markup can contain the basic building blocks of a web page like the title, headlines, paragraphs, body text and links, as well as image holders, lists, etc.. It can also designate the basic look of the text, headlines, etc. within the HTML itself by using the bold or headline tag. HTML is said to be one of the easiest languages to learn because a lot of it is human readable and relatable. One of the most popular places to learn HTML online is W3Schools. You can find tons of examples of various HTML elements and even apply those concepts with hands-on exercises and quizzes. There's information on formatting, comments, CSS, classes, file paths, symbols, colors, forms and more. Codecademy and Khan Academy are two other free HTML resources worth checking out. Are HTML 5 Tags Case Sensitive?